Is your daily sprinkle doing more harm than good? Right after air and far ahead of food, we need water to stay alive. The adage is that a human can live three minutes without air, three days without water and three weeks without food. The body is 70 percent water by weight and 70 percent of the planet is covered by the aqueous element. You might think that our greatest exposure to water is when we drink it. You’d be wrong. It’s when we shower. The water on our planet has been severely jeopardized by the rampant use of chemicals over the past century. Chemicals in water are now the greatest threat to our water. For most of human history, the greatest threat was bacteria or other biological entities in our water supply. When bad bugs linked to typhoid, dysentery or cholera pollute water, populations get sick. Even the ancient Egyptians recognized the importance of clean water. As far back as the days of the pharaohs, simple filtration through cloth, sand or carbon was used to purify water. It wasn’t until the full understanding of microscopic bacteria in water that we turned to chemical disinfectants. Byproducts of bleach. Chlorine is the most common water disinfectant and has been in use for over 150 years. Used properly, it is a wonderful way to kill microorganisms in water. Chlorine is still the most commonly used disinfectant for that purpose. Municipal water suppliers use chlorine and add it to the water that is piped into our homes. There is no question that disinfected water has kept bacterial epidemics at bay for decades. There is also no question that chlorine is a dangerous chemical and leads to its own problems. Chlorine is toxic to the body and reacts with organic matter in water, releasing hundreds of harmful byproducts. Many are suspected carcinogens. The major ones are trihalomethanes or THMs. Scientific studies have linked THM to increased risk of cancer, notably bladder cancer and colorectal cancer. Some investigations have found that chlorination by-products may be linked to heart, lung, kidney, liver, and central nervous system damage. Other studies have linked THM to miscarriage. In recent years, water treatment facilities have started switching to a less reactive form of sanitizer, a combination of chlorine and ammonia called chloramine. It has its own share of problems. We are finding that the chloramine process significantly affected the presence of toxic iodoacetic acid and other bad chemicals. Shower of chemicals. Like the ancient Egyptians, municipal water utilities do a good job of filtering dirt out of our water supply. Usually the utilities also do a good job of killing bacteria, parasites and pathogens with chlorine or chloramine. In most cases, they meet all the requirements the federal government sets up for safe water. They insist that the water supply coming to your tap is safe and it is — by their standards. The problem is that we don’t really know exactly what is in our tap water. Neither do they. Utility companies are required to test only for a narrow range of chemicals and pollutants as dictated by federal regulations. That list leaves out hundreds if not thousands of chemicals that may be streaming into your house through the tap water such as farm chemical runoff, chemical toxins and even pharmaceutical drugs. Independent research by media outlets has found dozens of pharmaceutical drugs present in drinking water and utility companies rarely if ever check for those. And remember, the process used for water treatment is basically the same as that used over 150 years ago: some filtration and some bleach. Toxic stew from the shower to you. Many of us use bottled water. Drinking-water purification pitchers and kitchen faucet filters are popular items. Of course it makes sense to try to keep the water you drink as pure as possible. The thing to realize, though, is that 50 to 70 percent of the chemical load in your body is more likely the result of showering. A ten minute hot shower exposes us to more chemicals than a day’s worth of drinking water. After all, the skin is the largest organ of the body and it absorbs chemicals — and drugs — transdermally. The exposure is significant and worse than drinking tap water. 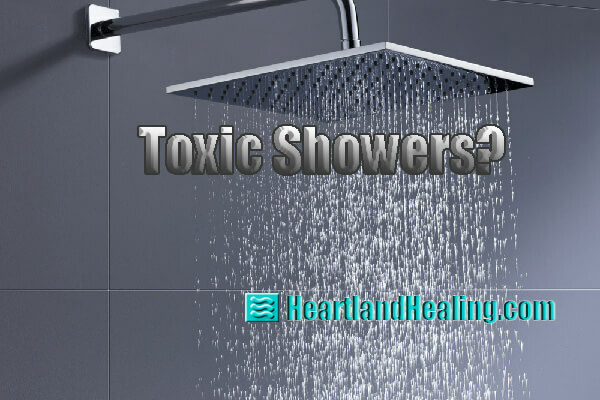 The vapor and steam from a shower also enter our body through the lungs and carry those chemicals with them. Since the majority of chemicals come to us in the shower, it makes sense to consider a way to keep them out of the pipeline. A solution. For drinking water, a reverse osmosis (RO) unit is the gold standard. I have one installed by Futuramic Systems (OmahaWater.com). Even if you live in an apartment, Futuramic can install one under the sink and rental is around $20 a month, way cheaper than all that bottled water you’re buying. And RO gets rid of almost everything bad. It’s a bit more complicated for showers. A shower-head filter like one available at No Name Nutrition, for example, can remove some of the chemicals. But for cities using chloramine, a shower head unit won’t complete the job. The chloramine molecule is too persistent. The best solution then is a home-wide filter system (again, Futuramic offers a low cost rental) that can handle the chloramine… and everything else bad. Clean water is not a luxury. It’s a necessity.